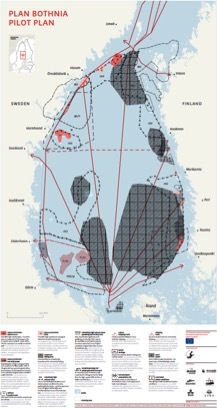 The Plan Bothnia project has tested transboundary Maritime Spatial Planning (MSP) in the Baltic Sea. The project used the Bothnian Sea area between Sweden and Finland as a case study and focused on planning inventory and the elaboration of MSP rules and principles for this area. The project held five meetings with partners and invited participants focusing on different steps needed to reach the final goal: the pilot plan for the Bothnian Sea. The project results were documented in the book “Planning the Bothnian Sea”, which was prepared as a collective effort by six partners and numerous participants from regional and national authorities in Sweden and Finland.